This recipe was adapted from one found in the Cooking Light Slowcooker Book. The recipe called for top round steak, which did become tender, but not as much as I predict chuck roast will be. Thus, I will write the recipe below as I hope to try it next. I enjoyed peeling the pearl onions as it was a new technique. Pearl onions were available at my grocery store in three different flavors--I used white. Since I'm not a fan of extremely dry wines, I used a pinot noir that I had open. 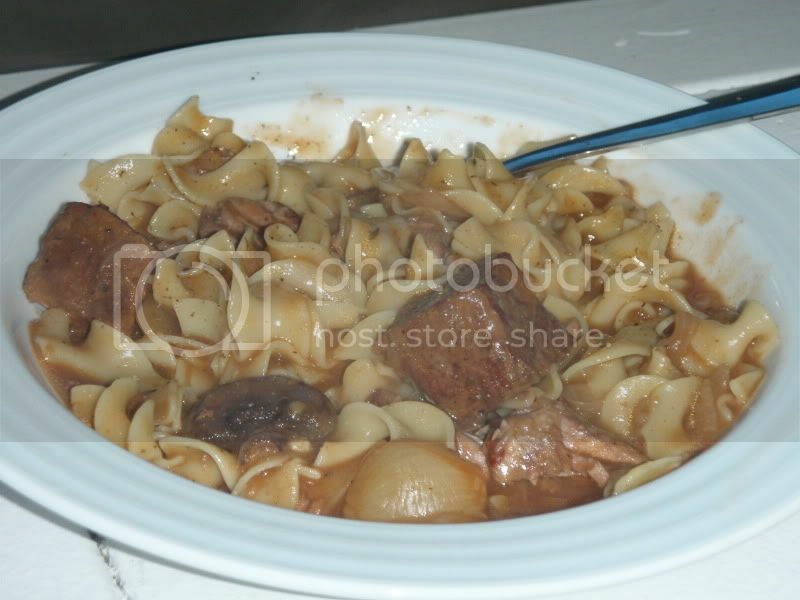 I used the suggested amount of onions and mushrooms, but in the future would use up to 50% more. 1. To peel the pearl onions, cut the root off. Drop in boiling water for 3 minutes. Drain. Skins should slide off easily when your pull from the other end. 2. Brown beef cubes in an nonstick skillet. Add meat to slow cooker, along with pearl onions and mushrooms. 3. In same skillet used to brown the meat, saute onions until tender. Add garlic during the last minute. 4. Add flour to onion mixture; cook for one minute. Whisk in broth, wine, and tomato paste. Continue cooking until thickened, about 2 minutes. Stir in thyme, salt and pepper, and bay leaf. 5. Pour wine mixture over meat and veggies in slow cooker. Stir gently until well-mixed. 6. Cook on low 6-7 hours until meat is tender. When ready to serve, prepare egg noodles according to package directions until al dente. 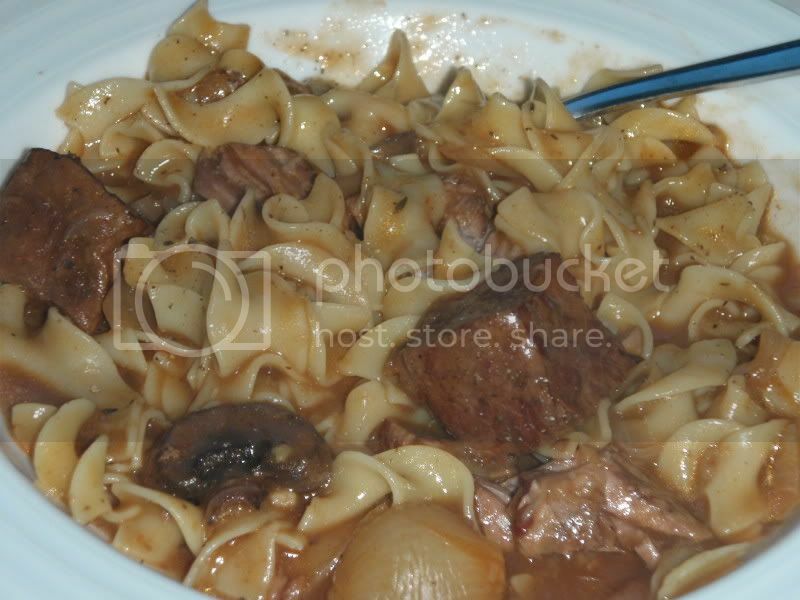 Drain and add noodles to meat in slow cooker so the noodles will soak up some of the sauce.